For the first time in 10 years we are having to deal with fleas. Hoping for a super cold winter to help control them this year. Poor little Teddy has had a difficult time finding flea medication that works. We tried the newly formulated Kirkland Signature brand but it didn’t control the fleas at all. So then we tried Frontline and he had a horrible allergic reaction to it. He even had to wear the “cone of shame” while recovering. Our cats are doing well with Frontline. 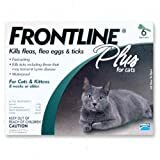 I found Amazon had good prices for Frontline flea medication and for our cats it continues to be my choice for flea control. Teddy’s vet recommended Trifexis for Dogs. It is a once a month flea medication pill. I love not putting medication on his back and so far it is controlling the fleas. Of course it costs a small fortune. Hopefully pill control for fleas will continue to develop and prices will come down in the future. Home control tip: vacuum everyday, especially places wear your pet sleeps. Empty the vacuum outside every time. Also, frequently wash pet bedding. Diligent cleaning works and doesn’t require spraying your home with chemicals. However, if the infestation is really bad do use a house spray that you direct onto furniture and carpets where your pets hang out. I used Ovitrol with good success. Only needed one application. I don’t recommend bug bombs. They weren’t effective when I used them in the past and I hated the feeling of spraying chemicals all over everything, yuck!